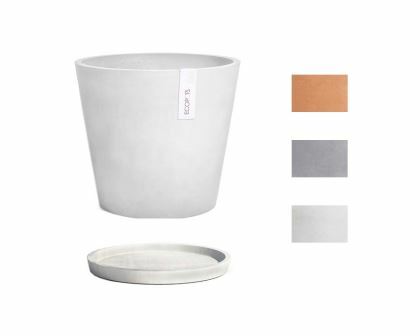 Made from recycled plastic, Amsterdam 20 is part of range of Classic shaped flower pots and saucers perfect for inside or outside. ECOPOTS are a new exciting line of stylish flower pots and planters from Europe It is great to have found a range of pots that not only look good but are sturdy, frost resistant and break proof. They are made from mixture of recycled plastics and stone powder and come in a range of timeless designs and colours.